The open star tea bag fold I used for this card is ideal for tiles that have a picture centered on them. When I printed the clip art for the tiles, I changed the dimensions so that they would print out square (175 x 175). 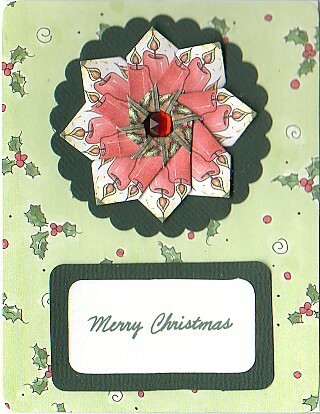 To make the star stand out, I put it on a dark green scalloped circle background. The greeting is handwritten using a metallic green gel pen.